It hasn’t been a great year for Chesapeake Energy (CHK), just coming down from a management meltdown and now giving up on its leases in New York over the state’s ban on high-volume fracking. It’s a battle that’s been on for two years over thousands of acres of natural gas leases in New York, where fracking has been banned for five years. The problem was that the landowners leased the acreage to Chesapeake before the advent of hydraulic fracturing, and now they don’t want these leases extended under the original terms, according to a report by Reuters. The report says that Chesapeake has now notified the landowners that it is giving up the fight, and that the decision should be finalized next week. But there’s more to this than a simple court case, and it is in line with Chesapeake’s more recent endeavors to strip away some of its expensive assets that have gotten it into trouble. Earlier this year, an uncomfortable conflict of interest issue saw Chesapeake Energy Corp. (NYSE:CHK) move to replace its CEO Aubrey McClendon. Stock prices were down and investors were revolting. McClendon actually co-founded the company, but investors didn’t like his track record, and he had already lost his post as chairman in 2012, so it was only a matter of time before he was replaced as CEO. Shareholders weren’t fond of McClendon’s management missteps and the company’s stagnating performance (which is only half of the story). McClendon had gone on an asset binge, gobbling up US shale basins. But the massive debt he amassed did no favors to Chesapeake. In 2008 we saw the worst of this start to hit when gas prices collapsed and the company was left with tons of assets that they couldn’t develop. Under new CEO Doug Lawler, who was recruited from Anadarko Petroleum, Chesapeake has done well—confidence restored. Since McClendon stepped down, stocks have risen 18% (since late January). While higher natural gas prices have helped a bit, it’s the rising oil production and the divestiture of assets that has helped most, aside from the change in management that made most of it possible. Chesapeake’s second-quarter earnings for this year show it. The company beat Wall Street expectations and boosted its crude production forecast this year by 1 million barrels. Chesapeake’s shares jumped 6% last Thursday to a new 52-week high. The company’s second-quarter net income is still a far cry from where it should be. Its Q2 net income was $457 million, down from $929 million for Q2 2012. But the adjusted results are better than Wall Street had predicted, with shares rising $1.50 to $24.80. So, Chesapeake has been born again, and giving up the New York leases is probably a good thing. The company is hoping to raise $7 billion this year by selling off assets to reduce debt and spend more on drilling. And it’s the oil potential that the most promising. It’s doing well with crude production from its shale basins (most notably Eagle Ford, Texas). Production is up and expenses are down here, and the new management is intent on focusing on these strong points. So far, Chesapeake is on target to reach its sale goal to get rid of its approximately $12 billion in debt burden. On 2 April, Chesapeake sold 158,000 acres and 176 wells to Gastar (GST) for $75.2 million. On 16 April, it sold over 57,000 acres and 11 producing wells in Woodbine/Eagle Ford to Energy Exploration Partners (not sure how much for yet). 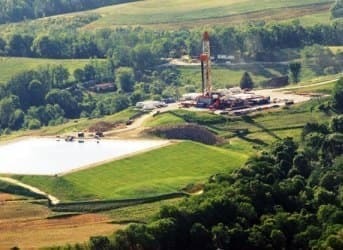 On 29 April, it sold 160,000 Marcellus acres to Southwestern Energy (SWN) for $93 million. It has also agreed to sell its 55,000 acres in the Northern Eagle Ford shale an 9,600 acres of non-operated assets in the Haynesville shale area to EXCO Resources Inc. (XCO) for $1 billion.